South Turkey is a great travel destination, even in winter. True, it is still too cold to swim and lie on the beach, but you get empty beaches, no queues in restaurants, plenty of parking spaces, no need to book anything in advance and ridiculously cheap flight and hotel prices. Plus the weather is at least balmy and you can still enjoy the outdoors. 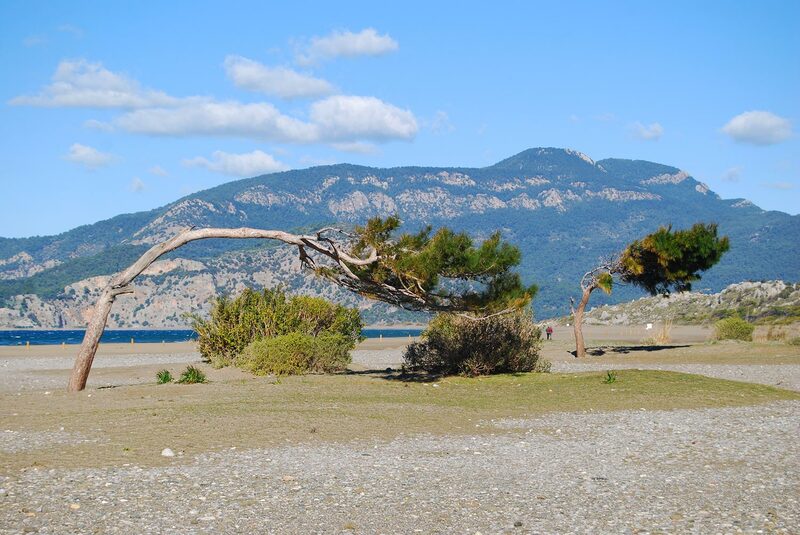 After visiting Marmaris and the pristine peninsula of Datça, we continued our trip through the region, heading east. 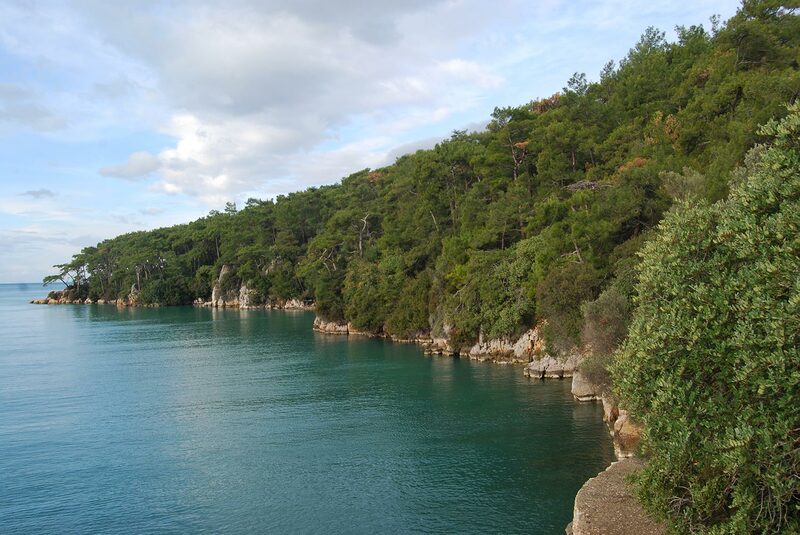 Our first stop was Akyaka, 30 kilometres north of Marmaris. Some friends had recommended us this lovely seaside town, nestled in a gorgeous bay between a strand of sand and high mountains. 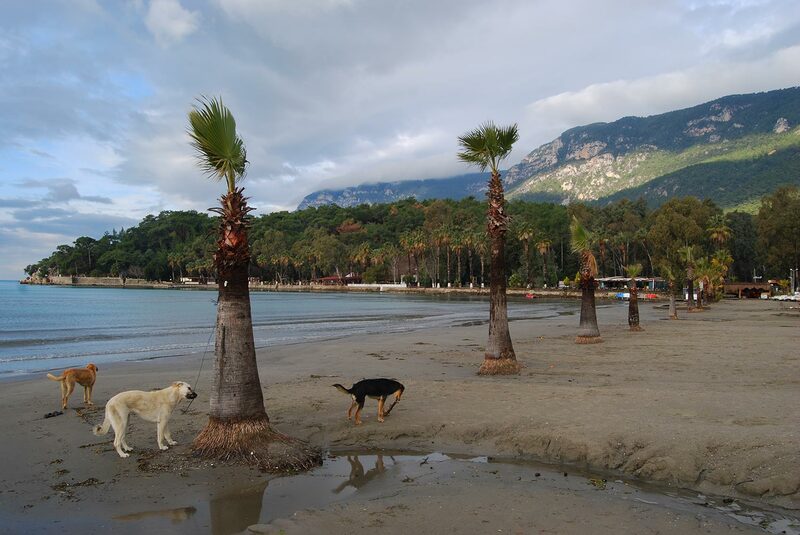 At Akyaka in the winter, your only company will be stray dogs. As everywhere else on this trip, except for a few tame stray dogs, the palm tree–lined beach was all ours during our morning walk. Besides the fabulous beach where verdant bush meets the immaculate blue sea, Akyaka boasts excellent cuisine and fine architecture. Many old houses have been restored and new ones have been built blending Ottoman and Aegean architectural elements into a unique style of whitewashed walls, wooden balconies, window fixtures and red-tiled roofs. To the town’s east lies a lush wetland with some pretty restaurants facing the river and, a few metres away, ancient rock tombs—a taste of what we would later see. Just 30 minutes east of Akyaka, Köyceğiz is a quiet town on the shore of its namesake lake. Although there is not much to do here, Köyceğiz is worth visiting, if just to admire the marvelous lake encircled by forested mountains. 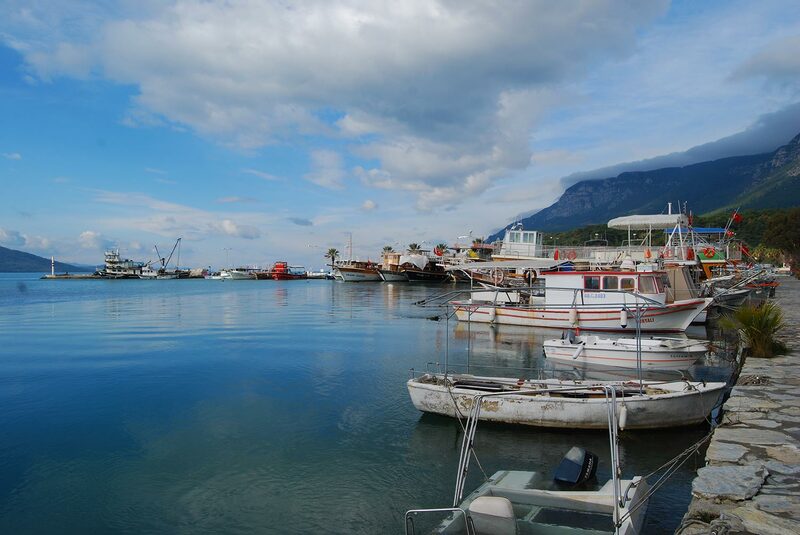 In the summer, many boats cut through the lake carrying loads of tourists back and forth between Köyceğiz and the more popular resort of Dalyan. Now, in the winter, the boats were moored in the dock and only a few kayaks and ducks rippled the placid water. 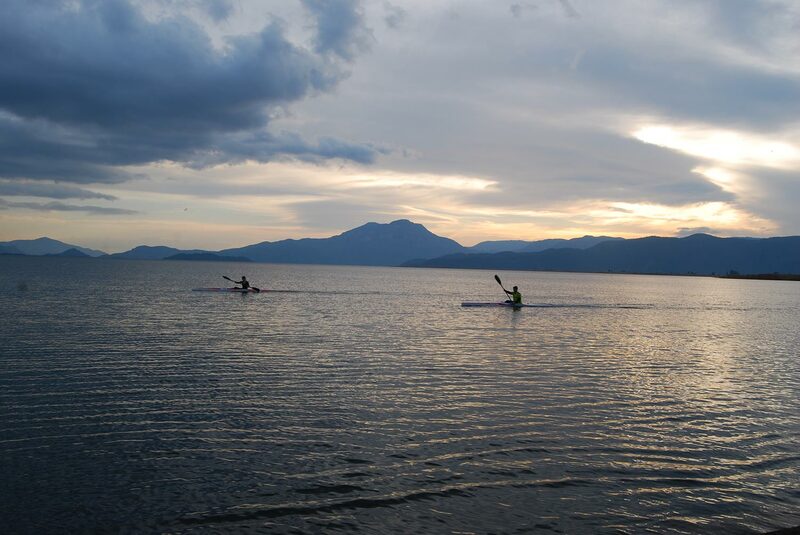 Kayaking ’til the sun goes down on Lake Köyceğiz. Apart from going on a boat tour, there are two things to do in Köyceğiz: stroll along the waterfront and have breakfast. And that’s exactly what we did. If you’ve never enjoyed a Turkish breakfast, you’re missing something special. It’s a sort of brunch including an endless list of ingredients: cheese, olives, butter, jams, spreads, tomatoes, cucumbers, omelets, sausages, eggs, honey, bread, a cream called kaymak and more, all accompanied by freshly brewed black tea served in little glasses. As one might expect, we weren’t able to walk for long after such a bountiful feast. The other main attraction of the lake is the mud bath at Sultaniye, on the southwest shore. In the high season we could have gotten there on a short boat ride, but in January we had to drive 30 km on a winding road running up and down the mountains. The ride was good for one thing, though: there are spectacular vistas over the lake that you can only see from the mountain roads. 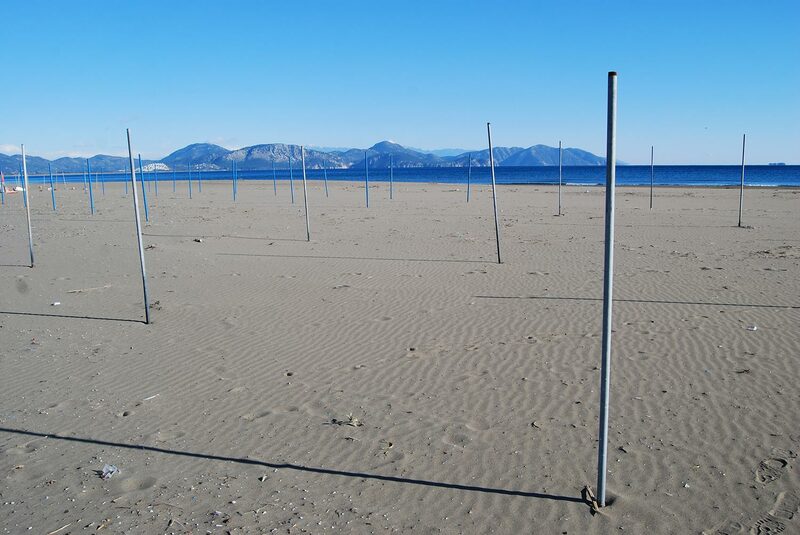 The beaches of southern Turkey are barren in the winter. As I had foreseen, only the thermal baths were housed indoor in hangar-like structures, whereas the tiny, definitely-not-appealing mud pool lay outside. “To hell with the cold,” I said, “I’ll do it!” And so I did, quickly plunging myself in that slightly stinky slime, then washing it off under the open-air shower. To my surprise, I didn’t pay for my bravado with any sickness. On the contrary—I felt quite invigorated from the experience. As the crow flies, Dalyan is a mere 15 km from Sultaniye; however, as there is no bridge or ferry boat to connect the shores of the river (maybe the ferry boat does operate in summer), we had to drive back to Köyceğiz and all around the lake for about 50 km to reach our next destination. Köyceğiz Lake, encircled by verdant trees. The charming riverbank town of Dalyan that we had visited in the spring a few years ago looked much different in the winter. Most hotels were closed, as were restaurants, cafes, the tea garden facing the river and the impressive Lycian tombs hewn in the cliffs on the opposite shore. Yet the unusually cold weather and the strong wind didn’t prevent us from strolling around the town and witnessing a heart-wrenching sunset. Besides the rock tombs and the river, Dalyan’s main draws are the ancient city of Kaunos and the long Iztuzu beach, a protected nesting ground for the endangered loggerhead turtle. Kaunos was an important seaport built upon a peninsula formed by the curves of the river. Learning that nowadays it is eight kilometres apart from the sea will give you an idea of how much time has passed since its foundation in the 10th century B.C. Boats moored for the winter months on Lake Köyceğiz. Some of the architecture is incredibly well preserved: among the Mediterranean shrub where goats roam freely, you can see temples, ramparts, streets, the agora and the theatre. The most incredible sight, however, is the breathtaking panorama from the acropolis, which completely repays you for the strenuous climb up the hill. From here, at 152 metres, you can see ancient Kaunos and modern Dalyan and the river twists its way through plains, hills and mountains before merging with the sea at Iztuzu beach. South Turkey truly is one of the most beautiful areas of the Mediterranean. Very few places can offer the same blend of nature, history, culture, good food and affordability. No doubt I’ll be back here soon, summer or winter, and I know it won’t disappoint. Thank you for your comment, John. As Michael rightly pointed out, I’ve been living in Turkey for over 6 years. In this span of time I’ve travelled nearly all over the country and not even once I have experienced or perceived any danger, except of course for the terrorist attacks, which, sadly, are not a prerogative of Turkey only. I would also like to add that nationality is completely irrelevant. As far as I know the Turks have no resentment towards Americans (or Europeans for what matters). If someday you decide to visit Turkey, you’ll have the chance to appreciate all the hospitality and kindness of the Turkish people. How could going to Turkey be a safe place to be for an American tourist? The short answer, of course, is that anywhere is dangerous—more travellers are killed annually by motor-vehicle accidents than terrorism by far. The trick, I think, is to minimize risk, travel smart, and not let fear control your life.